Cholangioscopy is a noninvasive endoscopic method used for both direct visual diagnostic evaluation and simultaneous therapeutic intervention of the bile ducts. Peroral cholangioscopy overcomes some of the limitations of endoscopic retrograde cholangiopancreatography (ERCP). Pancreatoscopy is the direct visual evaluation of the pancreatic ducts. Early cholangioscopes [2, 3, 5] had several limitations: they were very fragile and could break up; required two endoscopists; had only a two-way steering mechanism, which severely limited negotiation of ducts; and lacked working channels and irrigation ports. Thus, in the absence of more modern endoscopic technologies, this procedure was restricted to a few specialized centers worldwide for very specific indications. However, the Spyglass cholangioscopes have overcome many of the limitations posed by these earlier cholangioscopes. In addition, Itoi et al  tested a novel multibending prototype peroral direct cholangioscope (PDCS). This study showed that a cholangioscope passed over a guide wire or anchoring balloon had a high diagnostic and therapeutic success rate. However, results were not appealing with the free-hand insertion technique. Cholangioscopic view of (A) bile duct stone and (B) electrohydraulic lithotripsylithotripsy. Some studies have demonstrated the efficacy of peroral cholangioscopy in comparison to ERCP for evaluating many biliary disorders. Kawakami et al  showed that ERCP diagnosed intraepithelial tumor spread in only 22% of cases, whereas peroral cholangioscopy was successful in 77% of cases. Further, peroral cholangioscopy with concomitant biopsy accurately diagnosed 100% of cases. A study by Fukuda et al  showed that the sensitivity of combined ERCP/peroral cholangioscopy in diagnosing biliary lesions was 93% compared with only 58% for ERCP alone. The same study showed the superiority of cholangioscopy with biopsy in differentiating benign from malignant lesions with an accuracy of 100%. Additionally, cholangioscopy was useful in evaluating indeterminate filling defects seen on ERCP. A study by Tischendorf et al  showed that cholangioscopy significantly improves the ability to differentiate between benign and malignant biliary stenosis in patients with primary sclerosing cholangitis. Siddique et al  reported additional unexpected diagnostic information was provided by cholangioscopy for 18 of 61 patients. In seven of 61 patients, cholangioscopy revealed normal results when standard cholangiography suggested abnormal findings. This study also showed a role for cholangioscopy in biliary strictures in patients after liver transplantation and patients with hemobilia. See the image below. Cholangioscopic view of normal intrahepatic biliary mucosa. A study by Awadallah et al  reported that peroral cholangioscopy-guided biopsy was able to exclude malignancy in 31 patients with primary sclerosing cholangitis who had a prior finding of a dominant biliary stricture. A study by Itoi et al  found that cholangioscopy with biopsy can diagnose benign and malignant lesions with a sensitivity of 99% and specificity of 95.8%. Peroral cholangioscopy has also been evaluated as an effective tool for evaluation of pancreatic ducts. A study by Yamaguchi et al  reported improved ability to diagnose intraductal papillary mucinous neoplasms of the pancreas by pancreatic cytology using mother-baby cholangioscopes. This study also concluded that there is no diagnostic value with pancreatic juice cytology in diagnosing pancreatic carcinoma. Studies evaluating the efficacy of the Spyglass cholangioscopy system have reported that direct visualization improves the accuracy of cholangiographic findings and has good positive predictive value in evaluating patients with biliary obstructive symptoms of indeterminate origin. [4, 22, 23] In one series, cholangioscopy-guided bile duct biopsies could be successfully performed in 89% of cases. Notably, the sensitivity of this technique for diagnosing intrinsic malignant strictures was higher than the transpapillary route. An unanticipated benefit of the high sensitivity of cholangioscopy is that it has revealed previously unappreciated weaknesses in ERCP-mediated evaluation and diagnosis of biliary stones. Parsi et al  were able to diagnose at least 29% of ERCP-missed biliary stones by subsequent cholangioscopy, subsequently concluding that rates of missed stones on ERCP may be higher than previously thought. The same study reported a success rate of 92% in treatment of biliary stones using electrohydraulic or laser lithotripsy. Moon et al  reported excellent success with lithotripsy with electrohydraulic or laser using ultraslim cholangioscopes. In patients with difficult-to-treat stones, Arya et al  described peroral cholangioscopy with electrohydraulic lithotripsy in 94 patients reporting a 96% fragmentation rate and 90% ﬁnal stone clearance rate. Moreover, Hui et al  demonstrated significantly less cholangitis and a decreased mortality rate with peroral cholangioscopy-guided lithotripsy compared to biliary stenting alone in elderly patients. Multiple other studies reported similar success rates in treatment of biliary stones using peroral cholangioscopy and electrohydraulic or laser therapy. 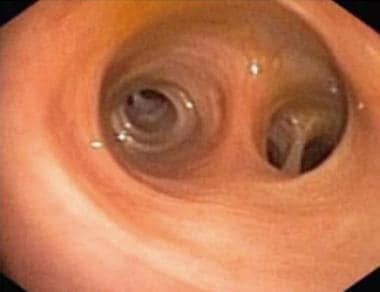 Thus, when performed by experienced and well-trained personnel, peroral cholangioscopy can be a safe and highly effective technique for the management of difficult-to-treat biliary stones. Early communication has to be established with the institutional pathology department to alert them of a possible small biopsy specimen arrival from cholangioscopy. As the quantity of tissue sample acquired during cholangioscopy is very small, this communication will ensure optimal processing of the precious specimens. Cholangioscopy involves significant manipulation of the biliary ducts. Antibiotic prophylaxis is generally given before the procedure, with levaquin, ampicillin, and gentamicin being the most commonly used antibiotics. Care must be taken to confirm coagulation parameters are normal before the procedure to prevent bleeding risk. Aggressive irrigation should be avoided when obstruction is visualized within the biliary duct to prevent cholangitis. Zhou Y, Wu XD, Zha WZ, Fan RG, Zhang B, Xu YH, et al. Three modalities on common bile duct exploration. Z Gastroenterol. 2017 Aug 1. [Medline]. Rosch W, Koch H, Demling L. Peroral cholangioscopy. Endoscopy. 1976. 172–175. Urakami Y, Seifert E, Butke H. Peroral direct cholangioscopy (PDCS) using routine straight-view endoscope: first report. Endoscopy. 1977 Mar. 9(1):27-30. [Medline]. Chen YK, Parsi MA et al. Peroral cholangioscopy (PO) using a disposable steerable single operator catheter for biliary stone therapy and assessment of indeterminate strictures - A multicenter experience using Spyglass. Gastrointest Endosc. 2008. 67:AB103. Nakajima M, Akasaka Y, Yamaguchi K, Fujimoto S, Kawai K. Direct endoscopic visualization of the bile and pancreatic duct systems by peroral cholangiopancreatoscopy (PCPS). Gastrointest Endosc. 1978 May. 24(4):141-5. [Medline]. Judah JR, Draganov PV. Intraductal biliary and pancreatic endoscopy: an expanding scope of possibility. World J Gastroenterol. 2008 May 28. 14(20):3129-36. [Medline]. [Full Text]. Woo YS, Lee JK, Oh SH, Kim MJ, Jung JG, Lee KH, et al. Role of SpyGlass peroral cholangioscopy in the evaluation of indeterminate biliary lesions. Dig Dis Sci. 2014 Oct. 59 (10):2565-70. [Medline]. Parsi MA. Peroral cholangioscopy in the new millennium. World J Gastroenterol. 2011 Jan 7. 17(1):1-6. [Medline]. [Full Text]. Yamauchi H, Kida M, Okuwaki K, Miyazawa S, Matsumoto T, Uehara K, et al. Therapeutic peroral direct cholangioscopy using a single balloon enteroscope in patients with Roux-en-Y anastomosis (with videos). Surg Endosc. 2017 Jul 21. [Medline]. Lee YN, Moon JH, Choi HJ, Lee TH, Choi MH, Cha SW, et al. Direct peroral cholangioscopy for diagnosis of bile duct lesions using an I-SCAN ultraslim endoscope: a pilot study. Endoscopy. 2017 Jul. 49 (7):675-681. [Medline]. Moon JH, Terheggen G, Choi HJ, Neuhaus H. Peroral cholangioscopy: diagnostic and therapeutic applications. Gastroenterology. 2013 Feb. 144(2):276-82. [Medline]. Moon JH, Choi HJ. The role of direct peroral cholangioscopy using an ultraslim endoscope for biliary lesions: indications, limitations, and complications. Clin Endosc. 2013 Sep. 46(5):537-9. [Medline]. [Full Text]. Itoi T, Nageshwar Reddy D, Sofuni A, Ramchandani M, Itokawa F, Gupta R, et al. Clinical evaluation of a prototype multi-bending peroral direct cholangioscope. Dig Endosc. 2014 Jan. 26 (1):100-7. [Medline]. Pohl J, Meves VC, Mayer G, Behrens A, Frimberger E, Ell C. Prospective randomized comparison of short-access mother-baby cholangioscopy versus direct cholangioscopy with ultraslim gastroscopes. Gastrointest Endosc. 2013 Oct. 78 (4):609-16. [Medline]. 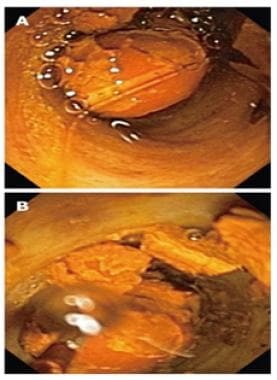 Mori A, Ohashi N, Nozaki M, Yoshida A. Feasibility of duodenal balloon-assisted direct cholangioscopy with an ultrathin upper endoscope. Endoscopy. 2012 Nov. 44(11):1037-44. [Medline]. Pereira P, Peixoto A, Andrade P, Macedo G. Peroral cholangiopancreatoscopy with the SpyGlass® system: what do we know 10 years later. J Gastrointestin Liver Dis. 2017 Jun. 26 (2):165-170. [Medline]. Monga A, Ramchandani M, Reddy DN. Per-oral cholangioscopy. J Interv Gastroenterol. 2011 4. 1(2):70-77. [Medline]. Wani S, Shah RJ. Probe-based confocal laser endomicroscopy for the diagnosis of indeterminate biliary strictures. Curr Opin Gastroenterol. 2013 May. 29(3):319-23. [Medline]. Itoi T, Kamisawa T, Igarashi Y, Kawakami H, Yasuda I, Itokawa F. The role of peroral video cholangioscopy in patients with IgG4-related sclerosing cholangitis. J Gastroenterol. 2013 Apr. 48(4):504-14. [Medline]. Sugiyama H, Tsuyuguchi T, Sakai Y, Ohtsuka M, Miyazaki M, Yokosuka O. Potential role of peroral cholangioscopy for preoperative diagnosis of cholangiocarcinoma. Surg Laparosc Endosc Percutan Tech. 2012 Dec. 22(6):532-6. [Medline]. Yamaguchi T, Shirai Y, Ishihara T, et al. Pancreatic juice cytology in the diagnosis of intraductal papillary mucinous neoplasm of the pancreas: significance of sampling by peroral pancreatoscopy. Cancer. 2005 Dec 15. 104(12):2830-6. [Medline]. Parsi MA, Neuhaus H et al. Peroral Cholangioscopy Guided Stone Therapy -Report of an International Multicenter Registry. Gastrointest Endosc. 2008. 67:AB102. Pleskow D, Parsi MA, et al. Biopsy of indeterminate biliary strictures -does direct visualization help? - A multicenter experience. Gastrointest Endosc. 2008. 67:AB103. Moon JH, Ko BM, Choi HJ, Hong SJ, Cheon YK, Cho YD. Intraductal balloon-guided direct peroral cholangioscopy with an ultraslim upper endoscope (with videos). Gastrointest Endosc. 2009 Aug. 70(2):297-302. [Medline]. Arya N, Nelles SE, Haber GB, Kim YI, Kortan PK. Electrohydraulic lithotripsy in 111 patients: a safe and effective therapy for difficult bile duct stones. Am J Gastroenterol. 2004 Dec. 99(12):2330-4. [Medline]. Hui CK, Lai KC, Ng M, Wong WM, Yuen MF, Lam SK. Retained common bile duct stones: a comparison between biliary stenting and complete clearance of stones by electrohydraulic lithotripsy. Aliment Pharmacol Ther. 2003 Jan. 17(2):289-96. [Medline]. Parsi MA, Guardino J, Vargo JJ. Peroral cholangioscopy-guided stricture therapy in living donor liver transplantation. Liver Transpl. 2009 Feb. 15(2):263-5. [Medline]. Matsumoto N, Yokoyama K, Nakai K, Yamamoto T, Otani T, Ogawa M. A case of eosinophilic cholangitis: imaging findings of contrast-enhanced ultrasonography, cholangioscopy, and intraductal ultrasonography. World J Gastroenterol. 2007 Apr 7. 13(13):1995-7. [Medline]. Chathadi KV, Chen YK. New kid on the block: development of a partially disposable system for cholangioscopy. Gastrointest Endosc Clin N Am. 2009 Oct. 19(4):545-55. [Medline]. Itoi T, Osanai M, Igarashi Y, et al. Diagnostic peroral video cholangioscopy is an accurate diagnostic tool for patients with bile duct lesions. Clin Gastroenterol Hepatol. 2010 Nov. 8(11):934-8. [Medline]. Igarashi Y, Okano N, Ito K, Suzuki T, Mimura T. Effectiveness of peroral cholangioscopy and narrow band imaging for endoscopically diagnosing the bile duct cancer. Dig Endosc. 2009 Jul. 21 Suppl 1:S101-2. [Medline]. Wang HP, Chen JH, Wu MS, Wang HH, Chou AL, Chang YS. Application of peroral cholangioscopy in an endemic area with high prevalence of hepatocellular carcinoma and choledocholithiasis. Hepatogastroenterology. 2000 Nov-Dec. 47(36):1555-9. [Medline]. Foerster EC, Schneider MU, Stommer P, Runge U, Domschke W. Miniscopes in gastroenterological endoscopy--inspection of the gallbladder and the biliary and pancreatic duct systems in autopsy specimens. Endoscopy. 1988 Nov. 20(6):316-20. [Medline]. Neuhaus H, Schumacher B. Miniscopes. Baillieres Best Pract Res Clin Gastroenterol. 1999 Apr. 13(1):33-48. [Medline]. Technology Status Evaluation Report: Duodenoscope-Assisted Cholangio pancreatoscopy. Gastrointest Endosc. 1999. 50:943-945. Sander R, Poesl H. Initial experience with a new babyscope for endoscopic retrograde cholangiopancreaticoscopy. Gastrointest Endosc. 1996 Aug. 44(2):191-4. [Medline]. Azeem N, Gostout CJ, Knipschield M, Baron TH. Cholangioscopy with narrow-band imaging in patients with primary sclerosing cholangitis undergoing ERCP. Gastrointest Endosc. 2014 May. 79(5):773-779.e2. [Medline]. Kalaitzakis E, Sturgess R, Kaltsidis H, Oppong K, Lekharaju V, Bergenzaun P, et al. Diagnostic utility of single-user peroral cholangioscopy in sclerosing cholangitis. Scand J Gastroenterol. 2014 Oct. 49 (10):1237-44. [Medline]. Ali JM, See TC, Wiseman O, Griffiths WJ, Jah A. Salvage of liver transplant with hepatolithiasis by percutaneous transhepatic cholangioscopic hepatolithotomy. Transpl Int. 2014 Dec. 27 (12):e126-8. [Medline]. Liu R, Cox Rn K, Siddiqui A, Feurer M, Baron T, Adler DG. Peroral cholangioscopy facilitates targeted tissue acquisition in patients with suspected cholangiocarcinoma. Minerva Gastroenterol Dietol. 2014 Jun. 60(2):127-33. [Medline]. Kawakami H, Kuwatani M, Etoh K, et al. Endoscopic retrograde cholangiography versus peroral cholangioscopy to evaluate intraepithelial tumor spread in biliary cancer. Endoscopy. 2009 Nov. 41(11):959-64. [Medline]. Fukuda Y, Tsuyuguchi T, Sakai Y, Tsuchiya S, Saisyo H. Diagnostic utility of peroral cholangioscopy for various bile-duct lesions. Gastrointest Endosc. 2005 Sep. 62(3):374-82. [Medline]. Tischendorf JJ, Kruger M, Trautwein C, et al. Cholangioscopic characterization of dominant bile duct stenoses in patients with primary sclerosing cholangitis. Endoscopy. 2006 Jul. 38(7):665-9. [Medline]. Siddique I, Galati J, Ankoma-Sey V, et al. The role of choledochoscopy in the diagnosis and management of biliary tract diseases. Gastrointest Endosc. 1999 Jul. 50(1):67-73. [Medline]. Awadallah NS, Chen YK, Piraka C, Antillon MR, Shah RJ. Is there a role for cholangioscopy in patients with primary sclerosing cholangitis?. Am J Gastroenterol. 2006 Feb. 101(2):284-91. [Medline]. Itoi T, Sofuni A, Itokawa F, Tsuchiya T, Kurihara T. Evaluation of peroral videocholangioscopy using narrow-band imaging for diagnosis of intraductal papillary neoplasm of the bile duct. Dig Endosc. 2009 Jul. 21 Suppl 1:S103-7. [Medline]. Judah JR, Draganov PV. The use of Spyglass direct visualization system in the management of pancreato-biliary diseases. Yu G, Sridhar S, eds. Diagnostic and Therapeutic Procedures in Gastroenterology. New York: Springer Science; 2011. 195-210. Cote GA, Azar RR, Edmundowicz SA, Jonnalagadda SS. Balloon-assisted peroral cholangioscopy by using an 8.8-mm gastroscope for the diagnosis of Mirizzi syndrome. Gastrointest Endosc. 2010 Jan. 71(1):181-2; discussion 182. [Medline]. Moon JH, Choi HJ, Ko BM. Therapeutic role of direct peroral cholangioscopy using an ultra-slim upper endoscope. J Hepatobiliary Pancreat Sci. 2011 May. 18(3):350-6. [Medline]. Weersma RK. Per oral cholangioscopy. Monkemuller K, Wilcox CM, Munoz-Navas M. Interventional and Therapeutic Gastrointestinal Endoscopy. Basel: Karger; 2010. 403-406. Chen YK. Preclinical characterization of the Spyglass peroral cholangiopancreatoscopy system for direct access, visualization, and biopsy. Gastrointest Endosc. 2007 Feb. 65(2):303-11. [Medline]. Inamdar S, Trindade AJ, Sejpal DV. An unusual diagnosis for a bile duct mass: eosinophilic cholangitis diagnosed by digital cholangioscopy. Clin Gastroenterol Hepatol. 2017 Jul 26. [Medline]. Larghi A, Waxman I. Endoscopic direct cholangioscopy by using an ultra-slim upper endoscope: a feasibility study. Gastrointest Endosc. 2006 May. 63(6):853-7. [Medline]. Barakat MT, Girotra M, Choudhary A, Huang RJ, Sethi S, Banerjee S. A prospective evaluation of radiation-free direct solitary cholangioscopy for the management of choledocholithiasis. Gastrointest Endosc. 2017 Aug 7. [Medline]. Waxman I, Dillon T, Chmura K, Wardrip C, Chennat J, Konda V. Feasibility of a novel system for intraductal balloon-anchored direct peroral cholangioscopy and endotherapy with an ultraslim endoscope (with videos). Gastrointest Endosc. 2010 Nov. 72(5):1052-6. [Medline]. Spyglass System and images from the biliary system.